Don't overcook! Grass fed beef is made for rare to medium rare cooking. If you like well done beef, then cook your grass fed beef at very low temperatures in a sauce to add moisture. Since grass fed beef is extremely low in fat, coat with olive oil or a favorite light oil for flavor enhancement and easy browning. The oil will prevent drying and sticking. Grass fed beef has high protein and low fat levels, the beef will usually require 30% less cooking time and will continue to cook when removed from heat. Remove the beef from your heat source 10 degrees before it reaches the desired temperature. Bring beef to room temperature before cooking. Remove steaks from fridge 1 hour prior to cooking, give roasts 1.5-2 hours. Use a thermometer to test for doneness and watch the thermometer carefully. 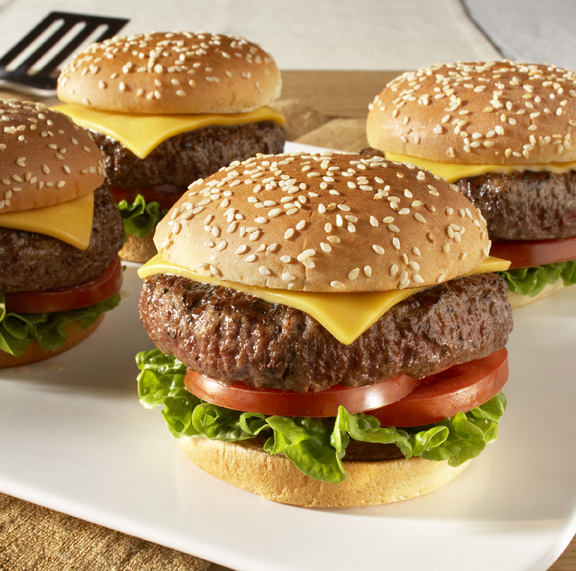 Since grass fed beef cooks so quickly, your beef can go from perfectly cooked to overcooked in less than a minute. 120-130 degrees for rare, 130-135 degrees for medium-rare, 140-145 degrees for medium, 150-155 degrees for medium-well. Rare to medium rare is best. Keep in mind that Internal temperature will rise 5 to 10 degrees as meat rests after being taken off of heat. Never use a fork to turn your beef . . . precious juices will be lost. Always use tongs.